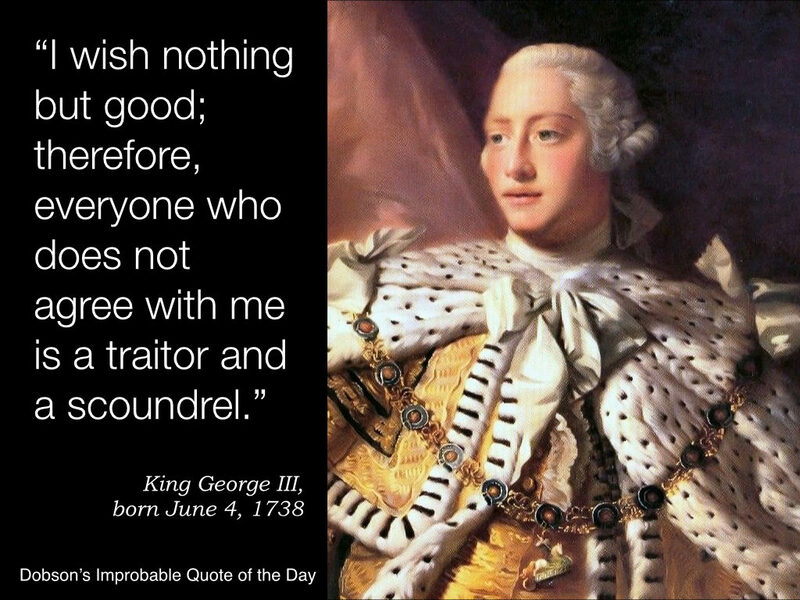 What motivates this blog post is the quote from King George III above, which appeared on one of my Pinterest boards: Dobson’s Improbable Quote of the Day for June 4. It had a lot of resonance for me: while George III said it aloud, a lot of people — including me — feel that way, at least from time to time. I didn’t aim it at left or right, because that particular feeling is independent of which side of the fence you fall on. Within a minute or two of sharing the link on Facebook, a comment appeared: “Substitute ‘racist’ for ‘traitor,’ and you have Barack Obama.” I deleted it at once and sent a message to the poster explaining my desire to keep politics off my wall. It was some hours before I checked Facebook again. Obviously, that quote had triggered strong political reactions, because now I had two political comments: “Didn’t realize the tea party was so old,” and “Still the official motto of the Republican party?” People on both sides clearly saw this quote as describing the attitudes of their political opponents. There are, I think, few things in the world more useless than having a political argument on Facebook. There are never any winners, only losers to one degree or another. Those who’ve known me for a long time know I am a man of passionate political opinions, with an unfortunate tendency to use scorched earth rhetoric when provoked — and I provoke more easily than I should. This tends not to end well. One of the most popular posts in this history of this blog appeared March 2, 2010: You’re Not Being Reasonable. In that post, I tried to establish some objective standards for reasonableness in political discussions, virtually all of which I’ve violated at one time or another. The cost of those violations has been high: I’ve lost several friendships I valued. Mind you, it takes two to tango, but my own behavior is the only thing I can control, and I look at my own lapses of reasonableness and decorum as cause for shame and embarrassment. My obsession with cognitive biases (collected in my personal magazine Random Jottings 6) and argumentative fallacies (only partially done, and on my ever-growing list of projects to complete One Of These Days) has done a lot to convince me of the futility of political argument. Confirmation bias alone, the tendency to interpret information in a way that conforms to your preexisting beliefs, derails most discussions before they get started. None of us can shake personal bias altogether, but we can work to limit its effects on our thinking. Because of the operation of cognitive bias (I include my own bias as well as that of others), I can’t think of a single situation in which someone’s mind has been changed through a Facebook argument, or indeed through an argument of any kind. When I have changed my mind, it’s not because of someone’s argument but rather someone’s behavior or personal actions, or my evolving understanding of the world around me. If I have changed someone else’s mind, it is for the same reasons. My social media activity is a combination of personal and professional. A lot of my Facebook friends are actually friends, or at least friendly acquaintances, but many are professional relationships (LinkedIn has been pretty useless in that regard), and a surprising number are people I’ve actually met and gotten to know through Facebook itself. (Having grown up in science fiction fandom, I’m used to having friends I’ve never actually met in person.) Some of my Facebook friends have political opinions I find congenial, but a whole lot of them don’t. In other words, there are plenty of reasons for me to stay out of politics on Facebook. My formative political experience was Alabama during the civil rights years. We supported civil rights in a time and place where that was an extreme minority position. My father considered marching in Selma, and only refrained because he was told his job was on the line. He was generally unafraid of confrontation and had a take-no-prisoners attitude toward those with whom he disagreed, and in that, I took after him. I believed — and still believe — that the segregation side was not merely wrong, but evil. That’s not to say I thought the people who held those beliefs were necessarily evil, but when you call someone’s beliefs evil, it’s hard for them not to take it personally. I didn’t have a lot of friends in those days. Strangely, however, I now call lots of the same people my friends, though in many cases my feelings about their political opinions remain unchanged. Perhaps it’s the shared Stockholm syndrome experience of high school; perhaps it’s simply the realization that personal history matters. I can get along with people of dramatically different beliefs, but the way to do that is to focus on what we agree on and what we share, not what separates us. At least that’s the plan — the execution has been less than perfect. Yes, I occasionally find political pieces I want to repost, or comments I feel compelled to make. I created a Facebook list of people likely to find my political positions congenial, and when I can’t refrain from political comment, at least I don’t feel the need to rub it in the noses of those who disagree. I also feel more free to jump into other people’s Facebook discussions, especially when I agree with the original poster. After all, they brought up the subject, not me. It’s rare for me to comment when someone posts an opinion I find repugnant; instead, I simply hide the most regular offenders from my timeline and thus keep my blood pressure under control. I can never tell what posts will draw political reactions. In addition to Dobson’s Improbable History and Dobson’s Improbable Quote of the Day, I also explore my fascination with maps on a Pinterest board called, oddly enough, More Fun With Maps! I generally share them without much in the way of comment: a map should speak for itself. Some maps, however, lend themselves to one political position or another. I avoid sharing some maps because of the likelihood of triggering a political argument, but that doesn’t always do the trick. Maps I think of as fairly neutral have drawn sharply partisan responses. The same thing is true of quotes. Honestly, I didn’t think the King George III quote was going to provoke this kind of reaction. It is much easier, of course, to see the mote in thy brother’s eye than the beam that is in thine own eye. We notice the horrible and disgusting things people on the other side say about our side much more clearly than the horrible and disgusting things that our fellow travelers say about them. Whatever the merits of one position over the other, none of us have clean hands when it comes to rhetorical excess. While I’m wary of false equivalence, or “both sides do it,” as a general argument, in this particular case, I think it’s a fair observation. I wrote this blog post, and then shared it. I appreciated the sentiment. After all, politics is a Mug’s game.